Last week, I visited an elderly Iraqi couple in East Mosul. Their home was destroyed, like thousands of others, by ISIL, the Islamic State of Iraq and the Levant. Before peace returned to Mosul, this Iraqi family went through unimaginable hardships. When we met in their new home, rebuilt by many helping hands, I saw people who have regained their house and faith in the future of their children and grandchildren. This was a very touching and emotional experience. 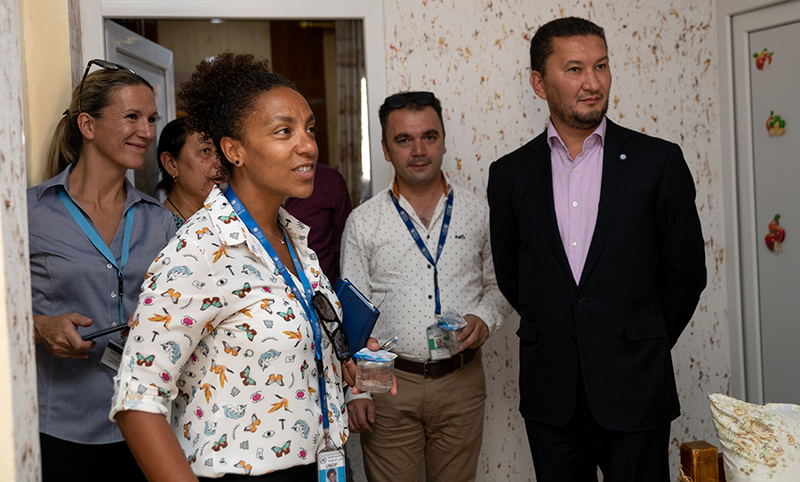 UNV Deputy Executive Coordinator Toily Kurbanov (right) and UNV Civil Engineer Gladys Gbegnedji (center-left) visit a newly rehabilitated home in Bartella, a town 20 km east of Mosul. With them, Sophie Lesselin, UNV Portfolio Manager (Arab States), and Engineer Feraz Ahmed Aqrawi, Consultant Civil Engineer in the Ninewa Plains team. Iraq has a long way to go towards peace and prosperity. The United Nations is doing its best to support the Iraqi people on this path and make the future bright for families like the one I met in Mosul. Behind this reconstruction, there is a lot of hard work done by UN agencies, local contractors and UN Volunteers. Among them is Gladys Gbegnedji, a civil engineer from Spain, who came to Iraq to help improve construction designs. UN Volunteers have been assigned across Iraq since 2011. They assist refugees and put in place peace building projects. They help Iraqis to cope with shocks from natural disasters and restore public services. In Northern Iraq, UN Volunteers like Gladys support hundreds of local engineers in reconstruction and ensure technical oversight. During my visit to Baghdad, Mosul and Erbil, I met more than 50 UN Volunteers, including 15 Iraqi nationals. Many I saw in action taking up assignments alongside UN staff. Seeing them at work in this country of determination and resilience showed me how local and international volunteers can make a difference for the future of Iraq. UN Volunteers bring know-how, empower civil society and help strengthen local institutions. UN Volunteers serve with the United Nation’s Refugee Agency (UNHCR), the United Nations Development Programme (UNDP) and other UN entities in Iraq. Fifteen UN Volunteers, all experienced engineers, support UNDP and the Iraqi Government in the rebuilding of Mosul and areas liberated from ISIL. Others help restart economic development and restore community livelihoods. The violence in Iraq has produced three million displaced persons across the country. Among them were my gracious hosts in that small rebuilt home outside of Mosul. However, being in their new home, their faith in the future is contagious. It gave me confidence that we will see Iraq rise from the rubble and become a whole and vibrant country once more.